Only a year after its release, the UNITED music video has reached millions of people and has been officially selected by twenty film festivals worldwide. With such success, UNITED’s human rights message is reaching people across the globe. 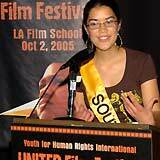 The 2nd Annual Youth for Human Rights International organizers decided that other youth should have the opportunity to express their passion for human rights through films just as did UNITED’s Director, Taron Lexton. 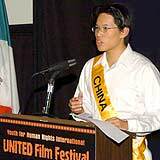 They therefore held the UNITED Film Festival as part of the International Youth Summit. The Festival was held at the Los Angeles Film School, which generously donated its space and time in support of this effort. 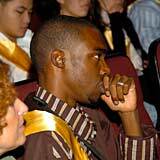 Youth from around the world, some as young as eight, submitted short films which communicated a human rights message. Seven were screened, including “Life is Great” by ten-year-old Cooper Stith (which emphasizes the right to play) and “One World Youth Project (Uganda)” by 19-year-old Jesica Rimington (which examines the right to a nationality). The Festival was more than a screening and award ceremony, but a chance to inspire others to create their own films and spread the message of human rights across the world. The event started with a two hour workshop covering the essential ingredients of movie making from writing and producing to casting, directing, shooting, creating visual effects and more. Drawing from hard earned experience five panelists used film clips and stories to give practical insights and warned of pitfalls for novice film-makers. 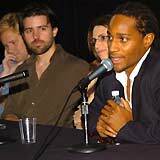 Panelists included director Taron Lexton, actor and director Joey Travolta, director Austin Smithard, actor, writer and director Michael Cory Davis and casting director and actress Lisa London. The panel was moderated by actress Denice Duff. The audience also met the delegates attending the International Youth Summit, who delivered stirring speeches about human rights and their own experiences with human rights violations. After the workshop and speeches the audience viewed the seven selected films with a more discerning viewpoint than an average movie goer. Awards were given to three films based on the human rights message they communicated. 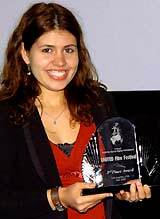 Third place went to “Street Talkin’ Human Rights” by 21-year-old Codi-Rose Collins, which tells everyone their 30 human rights from the United Nations Universal Declaration of Human Rights. Second to “Pharaoh’s Streets,” by Jethro Rothe-Kushel, dispeling myths that fuel discrimination against the homeless. The winner was “Miseducation,” by South African delegate, Nadine Angel Cloete, which focused on the right to a safe education. 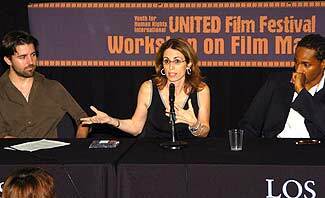 At the film festival, a leading member of the Los Angeles film community stated that she intends to nominate UNITED for a major national film award. Another official indicated his desire to sponsor next year’s festival, while a teacher from the Los Angeles Film School will encourage his students to create films that forward a valuable message to mankind.